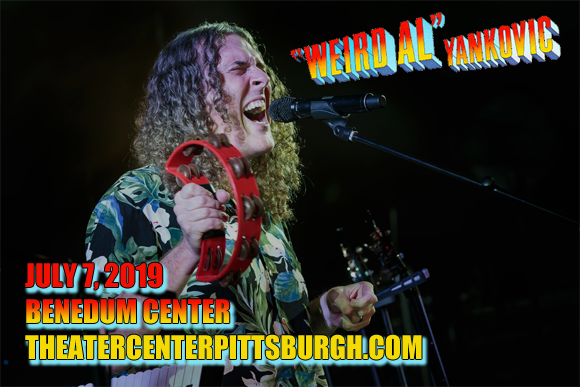 An irrepressible source of whacky fun and satire, comedy singer/songwriter Weird Al Yankovic comes to Benedum Center on Sunday 7th July 2019 on his Strings Attached Tour! Known for his polka-playing on the accordion and his second-to-none parody songs, Yankovic is taking his live show further than ever before, employing the incredible production values, props and costumes he's known for, as well as backing from a full symphony orchestra! Immersive and hilarious, this is a must-see event! Since the late 1980s, "Weird Al" Yankovic has been making audiences laugh with his hilarious, and spookily accurate, parody songs and music videos! Bursting onto the scene in 1984 with "Eat It" (a parody of Michael Jackson's "Beat It"), Yankovic became increasingly popular over the years with the help of MTV, where his skill with making music videos took his parodies to the next level, sometimes recreating scene-for-scene likenesses of the song's original video. His success continued into the '90s, with singles like "Smells Like Nirvana" (a takeoff of Nirvana's "Smells Like Teen Spirit") and "Amish Paradise" (a takeoff of Coolio's "Gangsta's Paradise"), and on into the 2000s – 2006 brought Yankovic his first top ten single with "White & Nerdy", and his first top ten album with Straight Outta Lynwood. Mandatory Fun (2014) is Yankovic's most recent release, and his first number-one album, hitting the top spot in its debut week.